Just like sheet masks, sleeping masks have become a part of my 'self spa' treatments. With the 'self spa' I mean products that provide my skin with that something extra, in addition to my regular skincare routine. Of course they don't replace real salon facials, but sometimes I just wonder if these regular facial at the salon really make a difference, expect the extractions part. Maybe my money would be better spend by buying more products? Okay, now I really sound like a skincare addict. There are so many sleeping masks on the korean market, I haven't tried many of them, but as for now I can say that one of my 'holy grail' sleeping masks is the Sulwhasoo Overnight Vitalizing mask. My skin seems to like everything I try from the brand, and who doesn't love it? Because the brand isn't cheap and it was my first time trying the product, I bought two sample tubes, 30 ml each. 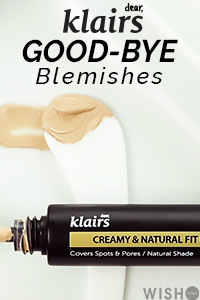 Seriously isn't it amazing that we can try all these Korean products in different sample sizes, I wish this would be the case for many western brands. The Sulwhasoo Overnight Vitalizing mask promises to hydrate and reawaken your skin's natural glow. The words 'hydration' and 'glow' are the keywords to look for if your skin is dry/dehydrated dull, just like mine. The ingredient list is full of herbal extracts. According to Sulwhasoo: The mask contains acute lobed angelica and pomegranate that are supposed to help brighten skin tone. Walnut extract create an essential moisture layer on the skin, promoting optimal absorption of nourishing ingredients and white mulberry extract minimizes redness and irritation. Running the formula through Cosdna no major red flags pop up, there are some minor acne triggers on the bottom of the list. Take the Cosdna analysis with a grain of salt, skin reaction depends on your skin type and the formulation of the product. As you can see in addition to the key ingredients mentioned by the brand, the mask contains numerous other extracts. Staying true to Sulwahsoo, the product has ginseng listened. What would Sulwhasoo be without ginseng? Ginseng has been used traditionally in eastern Asia over thousands of years. It has been used orally to treat various diseases and topics as a beauty treatment. Scientific studies might be limited, but the ones conducted so far show that ginseng protects against UV damage, reduces hyper pigmentation and wrinkles, increases and stimulates collagen production. In addition, topical applications has been shown to heal wounds and reduce skin inflammation. The full size product is a sleek elegant 120 ml tube. I have the sample size 30 ml tube, but still the packaging seems similar to the original, really beautiful. Its impressive that they give sample size products similar packaging as the full size products. In general, I just love how Sulwahsoo products are represented, so elegant, classic and traditional at the same time. Just as with all sleeping packs the mask is designed to be the final step of your PM skincare routine. I either use a sleeping mask or a sheet mask, never the two together in a routine, otherwise it can become to much for my face, but I imagine that folks with dry skin could use both. The smell is divine, it's that famous Sulwhasoo signature hanbang scent. The texture is quit creamy, thick and soft. How much you use depends on how dry your skin is, but I think you don't need much. I use a penny size amount for my entire face. Even thought the cream is thick it's not heavy or oily, spreads very easily. The instruction say to wash it off in the morning with only water, but I just cleanse my face regularly, like I always would. I think the mask has enough time to do its work while I sleep and is fully absorbed by morning. 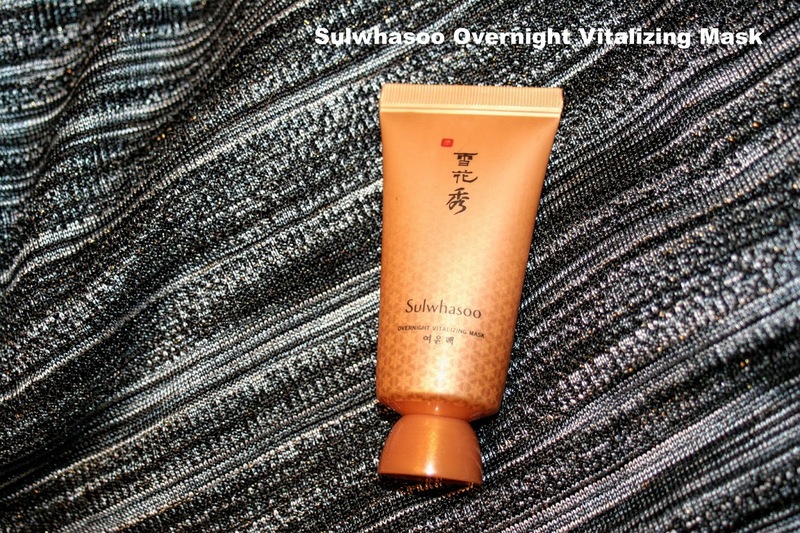 Compared to other sleeping masks the Sulwhasoo Overnight Vitalizing mask is a clear winner, it's definitely my favorite. The sleeping mask absorbs fast, but at the same time leaves your face really moisturized after application. The real results are visible the next morning, in addition to the extra 'moisture boost' skin is plump, soft and radiant. I think my face has that extra glow and brightening effect after using this mask. I had no adverse reaction, no irritations, breakouts etc. Many sleeping masks seem to deliver only a temporary short term effect barberry visible in the morning, that's not the case with the Sulwhasoo sleeping mask. 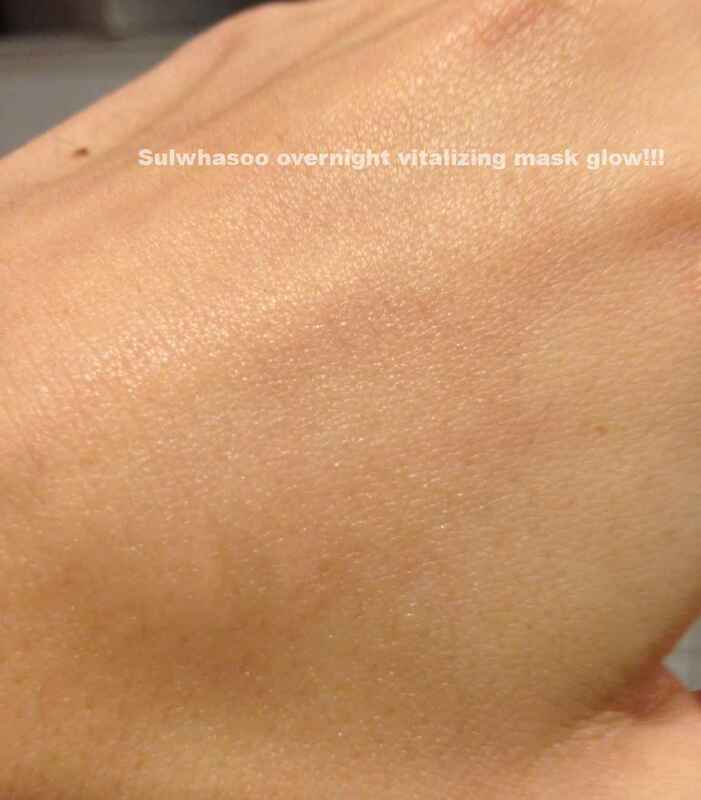 With skincare products, it's always difficult to detect long term effects, but what I know for sure is the Sulwhasoo sleeping mask gives a great moisture boost in no time, brightens, hydrated and makes your skin soft and smooth. I love the smell and texture of the mask, it makes the experience only better. 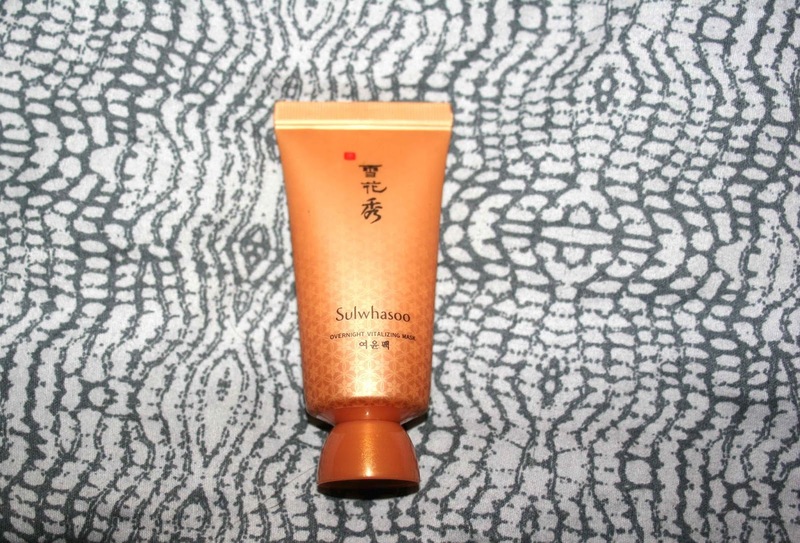 The ingredients are impressive, like with all Sulwhasoo products I like to believe in the 'magic' work of all the extracts this mask contains, my favorite is the ginseng. 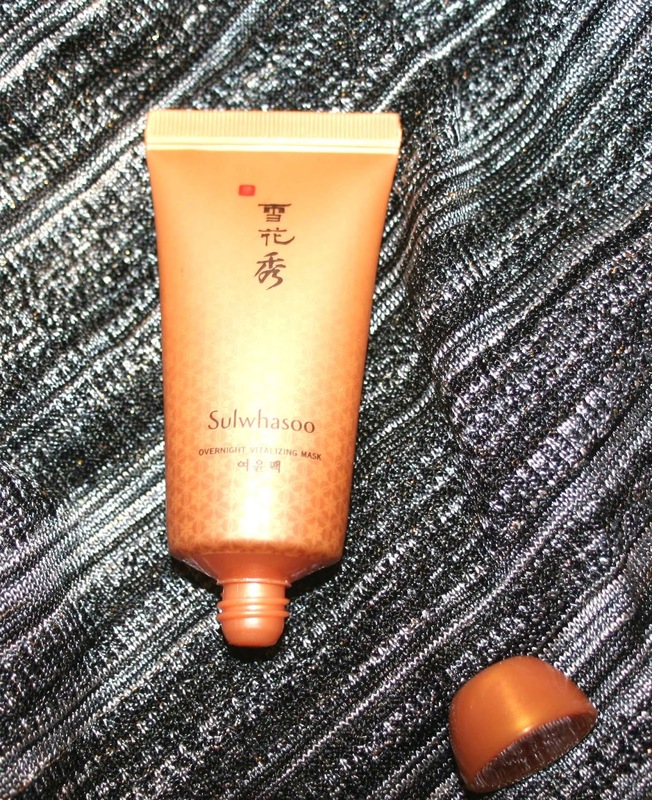 The sleeping mask can also be an alternative product for the famous Sulwhasoo ginseng cream,which is crazy expensive. The ingredient list is somewhat similar but the product much cheaper. That is what I heard, I haven't tired the cream yet so cant speak from experience. This is one of the few products were it's not really cheaper to buy samples, you can just go for the full size - similar price per ml. I purchased my 30 ml tubes on ebay for around 10$, you can find many sellers selling them between 10-16 $. You can buy the full size product on RoseRoseshop 37$ (on sale now), Amazon* for 49$ and 30ml for 10$, koreadepart 47$. Its definitely not cheap but worth it if you are willing to spend a little bit extra on a high-end sleeping mask. *This post contains affiliate links (with a*) Shopping with them supports the blog. I didn't know there were 30 ml tubes!! That was an awesome idea... I love this one too :) And haha Sulwhasoo is not Sulwhasoo without a little ginseng like you say. I've always wondered about the other products of Sulwahsoo, so this was definitely informative on learning more about the brand . i'm glad to know that it's not just their first step essence that does an amazing job ! I agree that it's so nice that such expensive brands offer a variety of sample sizes ^_^ I've been really wanting to try Sulwahsoo but hesitated on the high prices. I'm definitely going to look up more samples right now with all the sales to finally try it out! This sounds like an amazing overnight mask though, so well worth the price. I don't think this 30 ml is genuine.